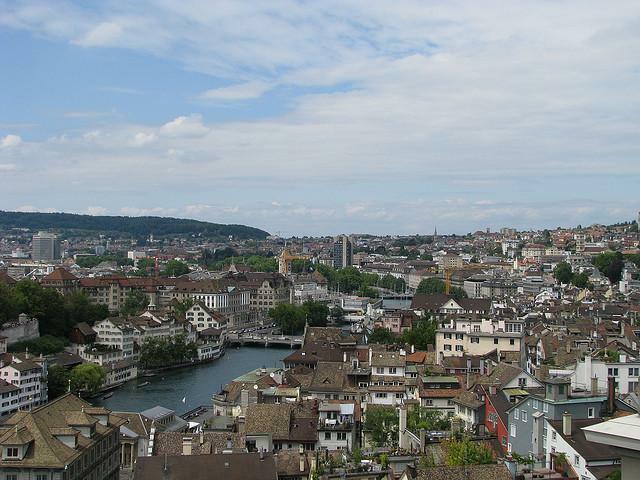 Zurich is Switzerland’s largest city. This city at the northern end of Lake Zurich has 390,000 residents and can proudly boast of the world’s highest living standards. In the middle ages, Zurich was the home of Ulrich Zwingli, a theologian and key figure of the Protestant Reformation, and therefore bears the epithet “Zwingli’s city”. 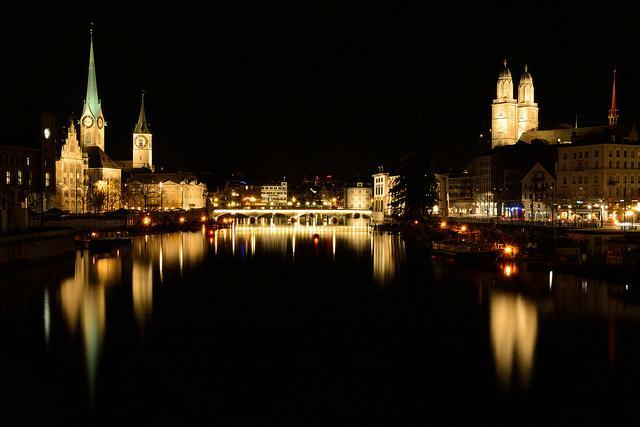 Due to its location spanning both banks of the Limmat river, it is often also called the “Limmat city”. The heart of the Inner City is lively Central Square. Zurich‘s landmark is the Great Minster. With its twin steeples, this Romanesque church stands out above the city’s rooftops. Anyone interested in learning more about Swiss history should definitely also visit the Swiss National Museum. Zurich’s City Hall represents an architectural particularity, as the structure was built on a fundament anchored in the Limmat River. A stay in Zurich must also include a shopping excursion along Bahnhofstrasse (Station Street). Its elegant boutiques leave no wish unsatisfied. Among the city’s attractions is also the Women's Minster, the so called Fraumünster Church, where one can view priceless stained-glass windows created by Marc Chagall. Rest and relaxation can be enjoyed in Zurich by taking a leisurely stroll along the promenades and parks on the shores of Lake Zurich. By railway, vacationers can reach the Uetliberg, Zurich’s local mountain, which offers a beautiful panoramic view of the surroundings. The world’s largest rainforest hall can be marveled in the Zoo on the Zurichberg, a wooded hill overlooking the lake to the east of the city. The city of Zurich contains hundreds of landmarks, most of them located in the well-preserved Old City. Medieval houses and imposing churches dominate the cityscape. One of the three Old City churches is the Fraumünster Cloister, a Zurich landmark dating from the year 853. The Fraumünster displays not only Gothic, but also Romanesque architectural elements. Above all the Choir and the high-arched transept are important architectural features of the church. Zurich’s chief landmark is the Great Minster. The characteristic twin steeples of the Romanesque church grace among others the seal of the University of Zurich. The third Old City church is St Peter’s Church, which displays the largest church clock face in Europe, with a diameter of about 8.6 meters. As well, Zurich’s City Hall is among the major points of interest in the Old City. The old City Hall, built in Renaissance style, is a symbol of Zurich’s great significance in the 17th century. Zurich plays a primary role in Swiss art and cultural activities. As well, the museums and galleries of the city, definitely worth visiting, witness to this. Among the best-known places to visit is the Zurich Kunsthaus, the Museum of Fine Arts. It opened its doors in 1910 and today houses one of the most important collections in Switzerland, with artworks from the fifteenth century up to the present. Not to be confused with the Kunsthaus is the Zurich Kunsthalle, the Museum of Modern Art, an exhibition institute located in a former bottling hall of the Zurich Löwenbräu brewery. In lectures, guided tours and exhibitions, contemporary international art is introduced to visitors. Another cultural landmark is the Museum Rietberg, which features art from Asia, Africa and Oceania. The only museum for non-European cultures in Switzerland is situated in the verdant Rieter Park. Zurich’s luxuriant parks offer vacationers many opportunities for rest and relaxation. The Botanical Garden of the University of Zurich shows a variety of different biotopes, among others the Mediterranean Garden, with a variety of fragrances, the Spring Garden, with beautiful spring and summer flowers, or the aquatic plant basin, which offers a view of both flora and fauna. A gift of the city of Kunming is the Chinese Garden of Zurich. The Chinese Partner City supported with an expert technical crew the construction of the Water Palace, the open gallery passageways and various pavilions. Without a doubt, the major points of interest in the green also include the Zurich Zoo. Over 375 animal species can be seen in the Zoological Garden on the Zurichberg. A main attraction of the Zoo is the Masoala Rainforest Hall. In the Madagascan Rainforest House, one can discover among others lemurs and chameleons.